Into town today to talk for a couple of minutes on the BBC World Service about the recent discovery of a planet orbiting the Kepler-16 binary system. 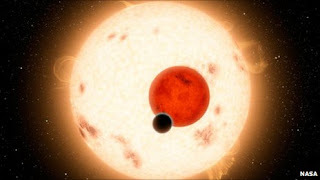 Both stars are smaller than the sun, one an orange K-type star, the other a red dwarf; the orbit of the planet, Kepler-16b, is similar to that of Venus; comparisons have been made to Star Wars' Tatooine (the hook on which so many news stories have been hung). But Kepler-16b is about the size of Saturn, although with a higher density, suggesting that it possesses a core of ice or rock about half its diameter, enveloped in deep atmosphere at a chilly -100° C. Not much chance for any carbon-based life like ours to see those double sunsets and sunrises, then, although it's possible that the planet's core might retain some heat and warm lower layers of its atmosphere, or that there might be a moon with an atmosphere that's both thick enough and with the right composition to generate a greenhouse effect. Given that the Kepler spacecraft has discovered one planet around a stable binary star system, it's pretty likely that there are plenty more out there, and that some will be much more Earth-like than Kepler-16b. Perhaps there are even planets around triple-star systems; maybe even a planet or two orbiting a system with six suns, as in Isaac Asimov's short story 'Nightfall', where night is a rare and frightening event . . .
Well, it's nice to know that there are real-life equivalents of science-fictional scenarios. Even better, we're beginning to understand that the universe is stranger than we can imagine. Kepler-16b isn't the first explanet to be discovered orbiting a binary system. There are two planets bigger than Jupiter orbiting the eclipsing binary NN Serpentis, 1700 light years away. The stars, a red dwarf and a white dwarf, are believed to be a cataclysmic variable system, with the material drawn off from the red dwarf forming an accretion disc around the white dwarf. When material from the disc falls on to the white dwarf, it triggers nuclear fusion and a cataclysmic outburst. If enough material falls on to the white dwarf it could increase the interior density of the white dwarf, ignite runaway carbon fusion, and trigger a supernova. Imagine the view from a moon of one of those gas giants if that happens . . .
"Probably the most special day I've had as a rover [driver] was the day I built my first drive solo on Mars," [Ashley] Stroupe said. "We were on the plateau on Husband Hill, and we were driving along the edge to get imagery of the valley below. I parked us right on the edge and got a spectacular view." "I remember looking at those tracks and realizing what they meant -- my first tracks on Mars, and the first tracks actually made by a woman driving on another planet," she said. "I am proud of it every time I see that panorama from the very top looking down at those tracks."